New Hampshire Legislative Office Building is located at 33 N. State St. in Concord across the street from the State House. If you want to see what your lawmakers are doing, now’s the time. The first year of the 166th session of the General Court is in full swing and you are invited. Today’s proposed legislation could become tomorrow’s law and you are welcome to have your say or just watch how the process works. Go to the Legislative Office Building, find the hearing room and sign a card if you want to testify in favor or against or just sit back and watch as interested citizens, lawmakers, experts and lobbyists tell committee members what they think is best, all free and open to the public. Make this year 2019 – the Bicentennial of the State House – the time to get to know your lawmakers. It’s really fun. 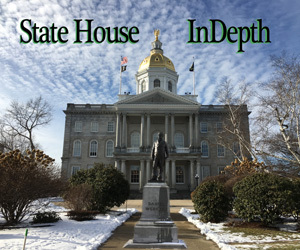 The New Hampshire Legislative Office Building is located at 33 N. State St. in Concord across the street from the State House. And here’s what’s happening today and the rest of the week. 10:00 a.m. HB 190, allowing gold and silver as lawful mediums of exchange. 10:30 a.m. HB 159, relative to condominium association unit owner payments in arrears. 11:15 a.m. HB 160, relative to the adoption of budgets and special assessments by condominium associations. 1:15 p.m. HB 436, relative to foreclosure of a lien on a condominium unit. 2:00 p.m. HB 308, establishing a condominium dispute resolution board. 10:00 a.m. HB 425-FN, relative to vulnerable users of highways. 10:30 a.m. HB 439, relative to unauthorized occupation of land or structures. 11:00 a.m. HB 134-FN, reducing the penalty for certain first offense drug possession charges. 1:30 p.m. HB 208, relative to the justified use of deadly force upon another person. 2:30 p.m. HB 218, relative to the use of deadly force by a law enforcement officer. disabilities to participate in athletics. 10:00 a.m. HB 108, relative to the number of days per year a charitable organization may offer bingo. 10:30 a.m. HB 424, relative to licenses for game operator employers for games of chance. 11:00 a.m. HB 165, prohibiting a public official from contracting out his or her duties. 1:00 p.m. HB 247, relative to the definition of the state building code. 1:30 p.m. HB 259, relative to building code violations. 2:00 p.m. HB 303, relative to certification of building code compliance inspectors. 10:30 a.m. HB 369-FN, relative to the controlled drug prescription health and safety program. 11:00 a.m. HB 350, relative to licensed prescribers of medical marijuana. 1:00 p.m. HB 310, relative to the membership of the wellness and primary prevention council. 1:30 p.m. HB 237, establishing the New Hampshire rare disease advisory council. 10:00 a.m. HB 295-FN-A, establishing a special marriage officiant license. 10:30 a.m. HB 305, relative to the duties of the registers of probate. under the supervision of a licensed attorney. 1:30 p.m. HB 421, relative to the requirements for summary judgment in a civil action. 10:00 a.m. HB 255, relative to shift differential pay for employees who work overnight. 11:00 a.m. HB 223, relative to night work. in the Hugh Galen Office Park. 10:00 a.m. HB 143, relative to incompatibility of offices. 11:00 a.m. HB 145, relative to the counting of secret ballots. 11:20 a.m. HB 146, relative to the counting of defective ballots. 1:00 p.m. HB 344, relative to gifts, honorariums, and expense reimbursements of county elected officials. 1:30 p.m. HB 301-FN-L, relative to funeral and burial or cremation expenses for assisted persons. of such removal to the department of environmental services. orange contribute to suicides by veterans. 11:00 a.m. HCR 4, encouraging media outlets not to broadcast the name or image of a suspected perpetrator of a mass shooting. 1:00 p.m. HR 6, urging the United States to lead a global effort to prevent nuclear war. 10:30 a.m. HB 438-FN, removing the exemption for premium cigars from the tobacco tax. and repealing the tax in 5 years. total amount of research and development credits against business taxes. 1:00 p.m. HB 390-FN, relative to the amount retained by a Keno operator. taxes collected and the appropriation of meals and rooms tax revenues to school building aid. 10:00 a.m. HB 203, relative to options in cable television franchise products. 10:30 a.m. HB 249, permitting restaurant owners to allow dogs in restaurants. 11:00 a.m. HB 257-FN, relative to purchasing alliances. 1:15 p.m. HB 268, relative to real estate commissions paid to unlicensed entities. 2:00 p.m. HB 309, relative to procedures for foreclosure of a mortgage. marijuana; HB 425-FN, relative to vulnerable users of highways; HB 439, relative to unauthorized occupation of land or structures; HB 445, relative to certifying as a habitual offender. 10:00 a.m. HB 429, establishing a committee to study ways to improve civic engagement in New Hampshire. 10:30 a.m. HB 431, relative to election officers at additional polling places. 11:00 a.m. HB 452, establishing a commission on the first-in-the-nation presidential primary. 1:00 p.m. HB 374, prohibiting certain state officers from forming political action committees. 1:30 p.m. HB 408-L, relative to postponement of town meetings and local elections. 10:00 a.m. HB 112, relative to the mechanical licensing board. 10:30 a.m. HB 119, relative to training requirements for electrologists. 11:00 a.m. HB 120-FN, relative to the regulation of body art establishments. 11:30 a.m. HB 121-FN, relative to the regulation of massage establishments. relative to the regulation of massage establishments. 10:00 a.m. HB 168-FN-A, making an appropriation to the FRM victims’ contribution recovery fund. 11:00 a.m. HB 225, relative to the National Guard Scholarship Fund. 1:00 p.m. CACR 1, relating to alcohol and drug abuse prevention. Providing that a portion of liquor commission revenue be used for alcohol and drug abuse prevention. of funding eligible wastewater projects under the state aid grant program. 10:00 a.m. HB 127, relative to the board of medicine and the medical review subcommittee. 10:30 a.m. HB 250, relative to oral prophylaxis for dental patients. 11:00 a.m. HB 422, relative to certain procedures performed in teaching hospitals. 11:30 a.m. HB 304, relative to policies required for health facilities and special health care service licenses. 1:15 p.m. HB 200, relative to serologic testing including Lyme disease. 2:00 p.m. HB 446, relative to initiating amendments and corrections to birth records. 10:00 a.m. Subcommittee work session on HB 103-FN-A, establishing the office of right-to-know ombudsman. 10:00 a.m. HB 210-FN, relative to civil actions against public officials in cities or towns.